A coded digital currency for which an encryption technique could be used to regulate the creation or generation of units and verify the transfers of fund over exchanges, independently operating of any bank; With over 1,200 cryptocurrencies and counting; the total market cap of approximately $160 billion circulating in the market as of day, the ‘next-gen gold’ has taken the financial world by storm. The implications of crypto currencies as an alternate for payment transactions is just the start, the applications are virtually limitless. Decentralization: Cryptocurrency creation and implementations are open source, controlled by code, and rely on a peer to peer network across the globe. Adaptive Scaling: Ability of the cryptocurrencies to work well in both large and small scales is another adaptive feature they exhibit. Open Source: Cryptocurrency is an open source where-in developers could create APIs without paying any fee and anybody can join and make use of the network. Cryptographic encryption: Cryptocurrencies use a system of cryptography, commonly referred to as encryption to control creation of coins and verify all transactions. Pseudo-anonymity: Owner of cryptocurrencies holds and supply their digital coins in an encrypted digital wallet. A coin-holder’s details and identification is stored in an encrypted digital address that they could hold control over it. Organizations can create cryptocurrency for internal use; for a club that they are a part of (for its members) or anything else. In layman terms, it is a currency created by the people and for the people. Although creating one is not that simpleThere are a few steps involved in creating a cryptocurrency; you cannot just go around creating cryptocurrency and expect people to buy, mine or hold it. It should present itself with some value or serve a purpose of intent. A combination of software and information components makes up a digital wallet. Where the software provides with the encryption and security for personal data and for actual transactions; Mostly stored on the client side and are easily maintained being fully compatible with payment services and e-commerce sites. 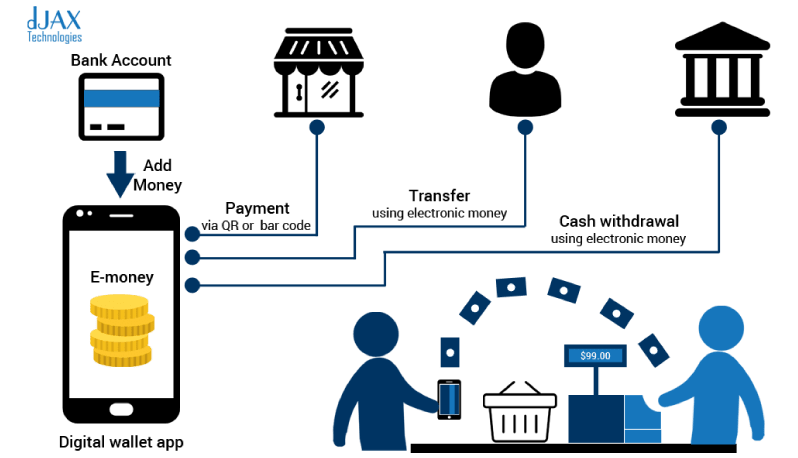 Digital wallets mostly refer to an electronic device which provides privileges to individuals to process and make all electronic transactions. The transaction purpose or intent can be anything ranging from e-commerce to cross border transactions and money transfer. However these so-called digital wallets cannot function without a medium. The wallet can be accessed on computers, tablets and mobile phones either online or by downloading an application. The user’s bank account could be linked to the digital wallet. This can function by an online mechanism or sometimes even the latest trend in wallets NFC (Near field communication) payments which is transferring or paying to the merchant’s terminal wirelessly. Wallet users aren’t required to fill out any kind of order forms on each and every site when they shop for an item; as the info has already been stored in the wallet is automatically updated and data entry is done into the order fields across the merchant sites whilst they use a digital wallet. Digital wallets are available to consumers free of charge, and they're fairly easy to obtain. When a consumer makes a purchase at a merchant site that's set up to handle server-side digital wallets, he types his name and payment and shipping information into the merchant's own form. When nearing the end of the checkout after purchase, the consumer is asked to choose a wallet of his choice by entering a user name and password and saving them for future purchases. Though a wallet is free for consumers, vendors charge merchants for these active wallets. Some wallet vendors make arrangements for merchants to pay them a percentage on all successful purchase directed through their wallets. Digital wallet vendors process the transactions between cardholders and participating merchants and charge merchants a flat fee.